Arctic Heating & Air, Inc. is dedicated to the complete satisfaction of our Los Angeles area customers. We keep you up to date on the emerging technology options for ideal indoor comfort control. Our professional consultants have the training and experience required to recommend the best solution for your unique indoor comfort control needs. Arctic Heating & Air, Inc. does not apply cookie cutter solutions across the board. Instead, our HVAC service reps will give you advice and recommendations centered around your specific air conditioning, heating and indoor air quality needs. 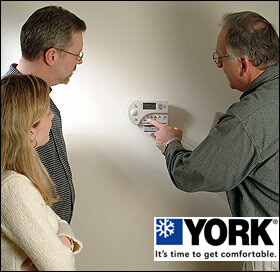 We proudly feature York® heating, cooling and indoor air quality products for their high efficiency and performance ratings. Additionally we protect your heating and air conditioning investment with optional HVAC preventative maintenance plans. Don't get caught in the heat or cold - let our professional consultants and service technicians keep you comfortable through any season. We promise, once you experience service from this Los Angeles HVAC contractor, you won't want to go anywhere else! However when the dust settles and all marketing is done, as mentioned above, we have one primary goal: The complete satisfaction of our customers. With York® heating and cooling products, we sleep easy at night knowing that our Los Angeles area customers have the very best keeping them comfortable. It just doesn't get much more important than that.